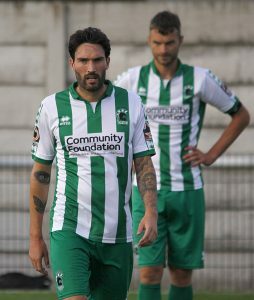 Two second-half goals in as many minutes from Tom Denton and Tom Platt inflicted a first defeat in two games for Blyth Spartans against Alfreton Town. Alun Armstrong’s men dealt relatively well with the power and height of the hosts’ front two 6ft4 Denton and Richard Peniket as Robbie Dale’s 24th-minute penalty cancelled out Denton’s earlier opener. The loss of on-loan Hartlepool United centre-back Aaron Cunningham for Blyth proved pivotal as Denton and Platt scored a quick-fire double just after the hour-mark as the visitors failed to recover. Blyth give it their best efforts to try and provide a tense finish but it was perhaps one game too much following their gritty performance to earn a point at Darlington in midweek. Armstrong was forced into one change for the trip to the Impact Arena – Robbie Dale returning from a broken hand in place of Jarrett Rivers, who did not travel due to illness. Similar to Wednesday’s test at Darlington, Blyth centre-halves Nathan Buddle and Cunningham had to contend with the height of Denton and former Gateshead striker Richard Peniket. Denton made his tall and physical presence known throughout the first opening 45 minutes – first coming on four minutes when his knockdown required another goal line block from Buddle to deny Peniket. Six minutes later, Denton’s shot from the left side of the box was diverted behind by a vital Adam Nicholson touch – however, Denton emerged as the goal scorer from the resulting corner – bundling the ball home at the near post. Alfreton should have quickly extended their advantage but Peniket squandered the close-range opportunity by blazing his side effort over the crossbar. Spartans showed they were dangerous when their attackers played on the shoulder and Sean Reid’s disallowed goal for offside from Ian Watson’s ball through was an instant sign of things to come. Without creating too much, an excellent piece of vision from Connor Oliver set Jamie Holmes away, whose attempt to round the keeper won a penalty on 24 minutes. Dale, cool as you like, sent the hosts’ keeper the wrong way as he dived to his right-hand side as proceedings settled down until half-time. Nevertheless, the home side still managed to carve out one more gapping chance – which brought the best out of Peter Jameson – stretching to palm away Denton’s header that looked destined for the bottom left corner. It was unclear what happened but Cunningham was forced off with an injury early in the second-half – which proved damaging for Spartans and their hopes of leaving the Impact Arena with some points. Spartans lost the threat of Reid at number 10 as he slotted into the heart of the defence with Buddle. And the crosses that Blyth had dealt with quite well in the first-half caused huge bother within two minutes. It was the typical sucker punch for Blyth. Just Maguire hit the post for Blyth following another Oliver ball in-behind, Denton went straight up the other end to restore the hosts’ lead on 65 minutes when he nodded Curtis Bateson’s delivery home. And in a blink of an eye, the game was virtually out of reach for Blyth when James Clifton’s free-kick was headed home by the unmarked Platt 3-1. Armstrong threw on Adam Wrightson in hope of mounting a comeback but his first bit of action was to witness another excellent save by Jameson – sticking out his right arm whilst off balance to deny Denton his hat-trick. The scoreline stayed the same. It was a case 0f three crosses, three goals for Alfreton. Alfreton: Ramsbottom, Clifton, Wilde, Platt, Gowling, Shiles (c), Bateson (Clarke, 76), Hotte, Denton, Peniket (Middleton, 74), Chettle. Subs not used: Nicholson, Bacon, King. Spartans: Jameson, Nicholson, I Watson, Green, Buddle, Cunningham (Horner, 53), Oliver (Wrightson, 68), Reid, Maguire, Holmes (Ardelean, 83), Dale (c) Subs not used: Skirpan, Butler.